Rett Syndrome challenges me and my ‘positive thinking’ every single day. This is an understatement. Where I used to naturally find myself always seeing the glass half full, I have to admit… doing that now is something that is extremely difficult for me to do. 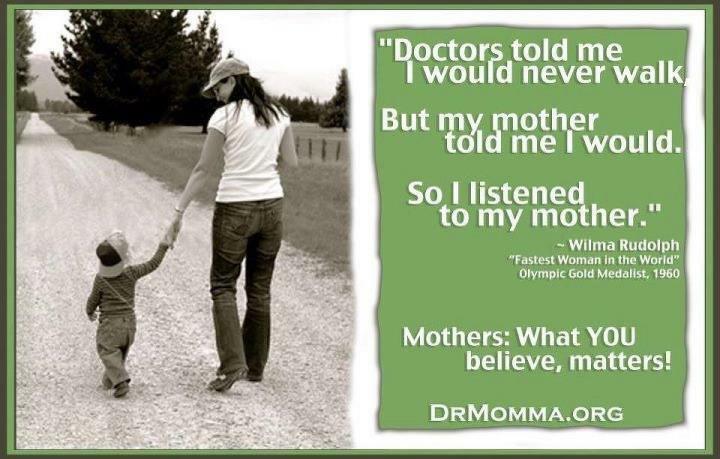 I needed the reminder that what I do as Claire’s mother, really does matter. Every bit of it. And she is taking every little (and big) bit in. Tonight at dinner, after seeing this picture, whether or not I believed it at the time, I told Claire that one day she would walk. She was in the middle of chewing her food, and she looked me straight in the eyes and paused. I said it again, “Claire… You are gonna walk one day… You are! !” and she continued to look at me, and then gave me the biggest smile. She understood me. Every single word. Her smile was huge, and her eyes were of purpose. Bottom line… one of my biggest wishes for Claire, is for her to walk independently. My 6 year old son asked me, “Mom… if Claire walks one day, what will happen?” I told him, “Nolan… we are gonna throw a party. One big party to celebrate because she’s worked so hard to get to this point.” And it’s true. This would be one momentous occasion that we will celebrate, for sure. She will be “2” on Easter Sunday. She has physical therapy 3x a week, and has just started aquatic therapy (these are in addition to her occupational and speech therapies… again, a post for another day). What she does in therapy, Sean and I try to replicate in our home setting. We try ‘hip helpers’ (aka: shorts that she wears to help keep her feet together), obstacle courses, different walkers, gait trainers and standers… She’s gone to the Cleveland Clinic mobility clinic to try out different types of equipment in addition to her therapies, and was fitted for a power wheelchair. 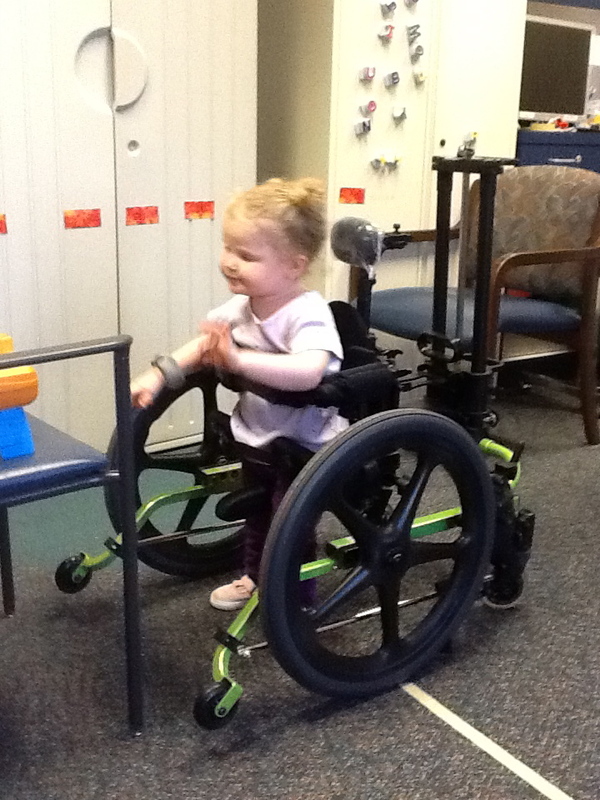 Whether or not she will be able to walk, we want to give her as much independence as possible. So we are exploring every single option. We get her toys that help motivate her… we get the toys she uses in therapies to try and create similar obstacle courses at home… we try and create ‘vertical space’ at home. Last week, she was fitted for orthotic shoe inserts. Depending on how she does with this, we may or may not proceed with getting her AFOs (ankle, foot, orthotics). It’s hard to sum up her therapies and what she’s doing, but these pictures and videos at least help paint the picture. 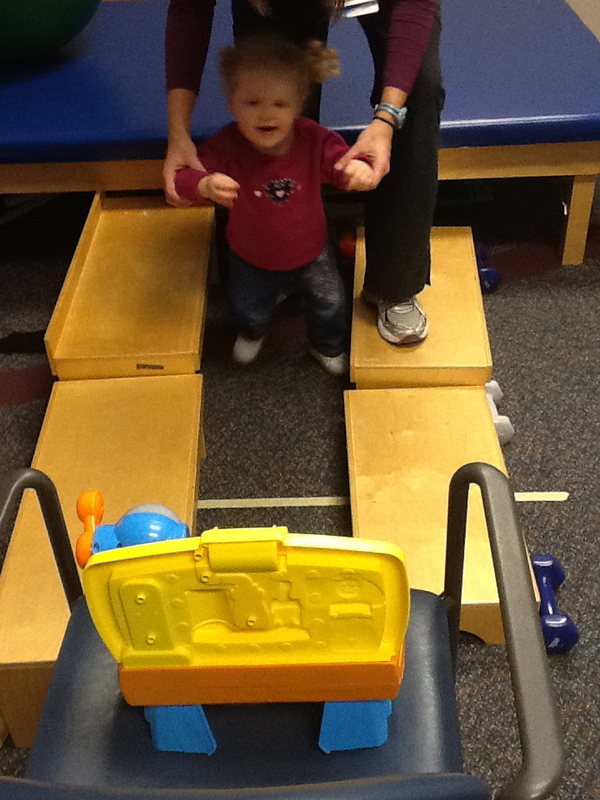 Claire doing an obstacle course during a recent physical therapy session. The goal is to use a narrow pathway to get Claire used to walking with her feet closer together. 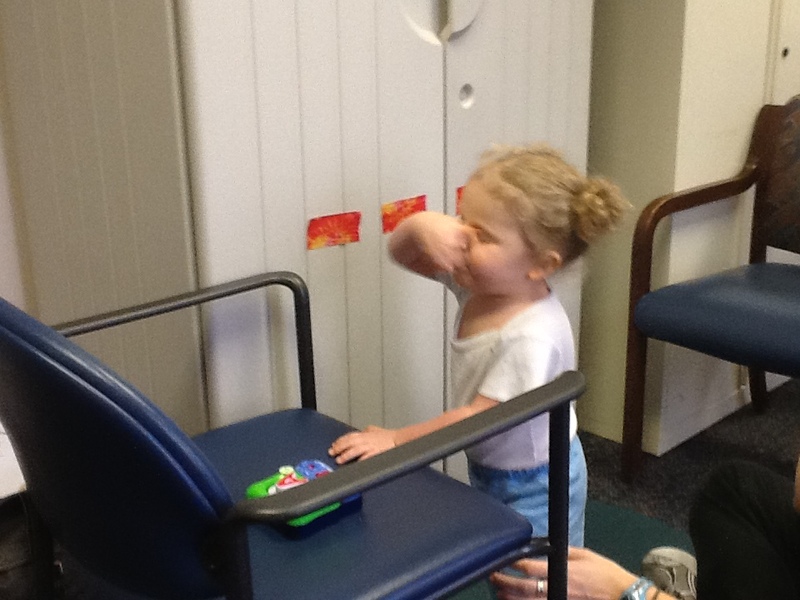 Claire's trying out a 'stander' at physical therapy to see if this will help her stand independently. Claire utilizing 'vertical space' at physical therapy. The tape on the cabinet is a visual queue to help Claire move from chair A to chair B.
Claire trying out a gait trainer at physical therapy. 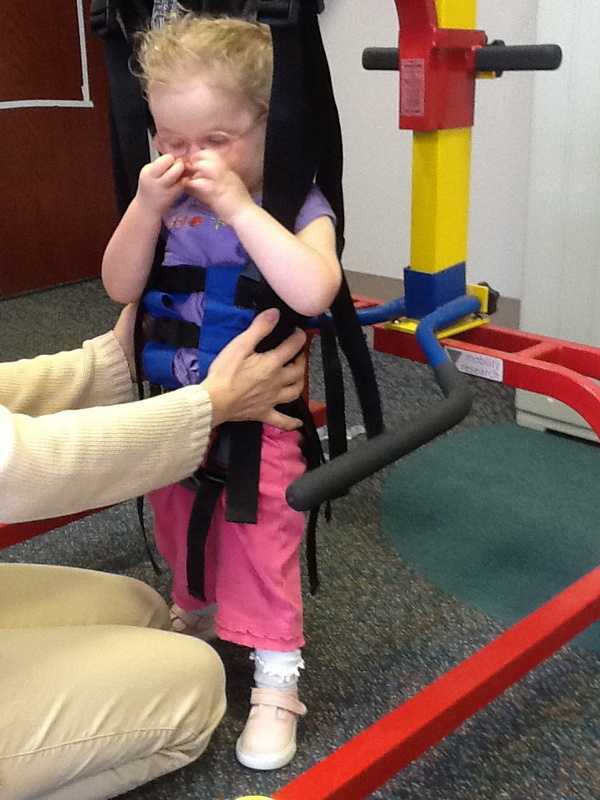 The gait trainer is to provide Claire with a means of moving independently. She wasn't crazy about this one...but we'll find the right fit. Claire attended the Mobility Clinic at Cleveland Clinic to be ‘fitted’ for a wheelchair. In a matter of minutes, she learned to turn this power wheel chair on her own using her head to apply pressure to the head rest. Claire’s physical therapist is using a trapeze to suspend one of Claire’s favorite toys in air to give Claire more confidence with her vertical space. It’s working – she takes her 1st steps (as I help Nolan with his homework)!